Reimbursement means reimbursement of the lowest price of generis. It helps to use finances optimally, acting Health Minister Ulana Suprun has said. "We will prescribe medicines using INN [International Nonproprietary Names], not trademarks. We will reimburse at the lowest price. Those who select more expensive medicine could pay additionally for it," she said in an interview with Interfax-Ukraine. Suprun said that negative experience [of the previous reimbursement project] was that medicines were prescribed not using INN, but the trademark, and doctors selected the most expensive medicines. Finally the funds earmarked for these programs ended quickly, she said. Suprun said that if even they are the cheapest generics, they would have effect, and patients would not have any problems with them. "These are absolutely normal medicines. Those who want to buy the most expensive medicines will pay for them themselves," she said. 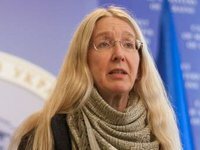 Suprun also said that the Health Ministry intends to introduce reimbursement for combination medications, while medications with active fractions included in the reimbursement project are present on the Ukrainian market.